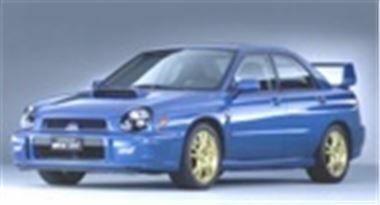 Yet another 11th September Frankfurt Show debut is the fully European Type Approved 261bhp Subaru Impreza WRX STi. UK sale date is set at January 2002. The Active Valve Control engine puts out 261.5bhp at 6,000rpm and 343Nm (253 lb ft) torque at 4,000rpm fed through a six speed gearbos to the car's four wheel drive system. 0 to 60 takes 5.2 seconds and top speed is 148mph. Further modifications over the standard car include larger 17 inch Brembo brake discs, 17 inch wheels with fatter 225/45 tyres, uprated suspension with inverted struts, front and rear Suretrac limited slip diffs, and a faster 2.6 turn steering rack. There will be two versions: one with a Prodrive upgrade. Subaru's standard UK 3 year or 60,000 mile warranty will apply. Prices, fuel consumption and CO2 output will be announced closer to the on sale date.